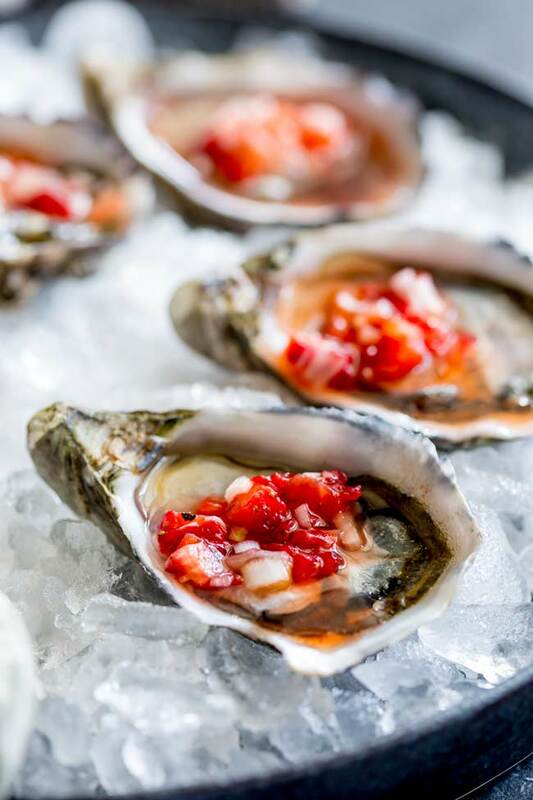 Oysters mignonette is an elegant and classic way to serve raw oysters in the shell. 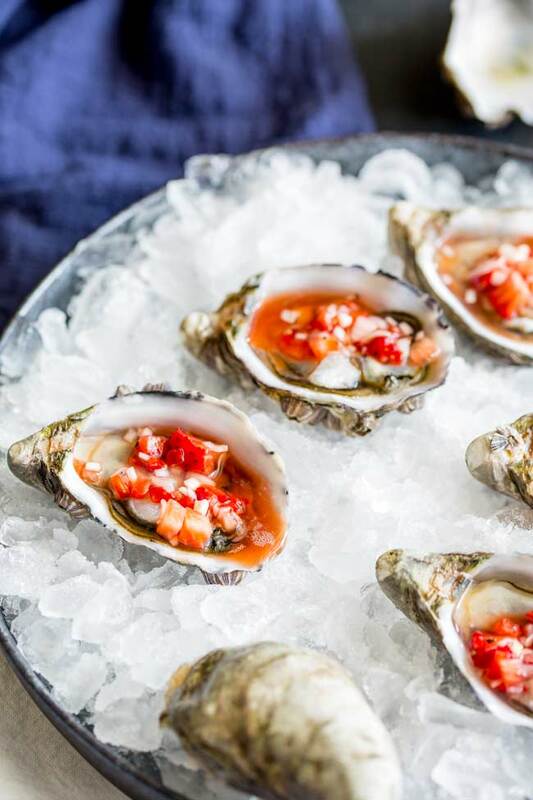 The fresh shucked oysters are drizzled with a mignonette dressing made with champagne vinegar, shallots, fresh strawberries and black pepper. Simple, elegant and delicious. 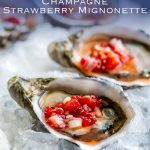 Plus these Oysters with Champagne Strawberry Mignonette are so easy to make! Impress your guests with one of the best restaurant quality appetizer at home. And the nutritional answer is yes! They are actually super healthy! They are low fat, full of protein, amino acids, iron and zinc. Studies have shown they can actually lower cholesterol and they are a better source of protein than chicken breasts! But for the rest of us, oysters will remain a treat. So when we get them we want to prepare them simply, deliciously and perfectly. Enter my Oysters with Champagne Strawberry Mignonette. You will find that many fishmongers sell oysters ready shucked, or they will shuck them for you on request. But I have a top tip today that BLEW MY MIND when I heard it. I got the tip from Jo over at The Farmhouse Pantry. Place your fresh un-shucked oysters in a bag in the freezer. Freeze overnight or until you need them. Remove from the freezer and rinse with cold water. Leave on a draining board to defrost. The shells will pop open slightly as they defrost and you can easily remove them. HOW EASY IS THAT!!!! No grit or broken bits of shell in your oysters and you can buy them in advance so no running around on the day of your party trying to get fresh oysters!!! Plus no serious injuries from trying to pop the shells! I probably owe Jo a bottle of bubbly for that tip as it has changed how I look at oysters forever! Oysters Mignonette, is a classic way to enjoy oysters. A traditional mignonette sauce is minced shallots, cracked pepper and vinegar. 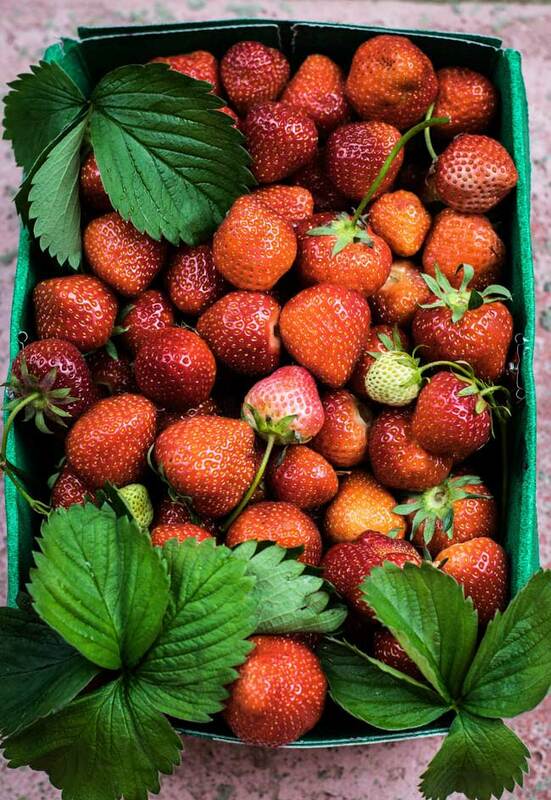 Here I am adding fresh strawberries for a delicious sweetness and a wonderful pop of color. Strawberries work wonderfully with the oysters. The natural sweetness balances with the natural saltiness. Then the sour of the vinegar and the fire of black pepper, these Oysters with Champagne Strawberry Mignonette are a taste explosion. 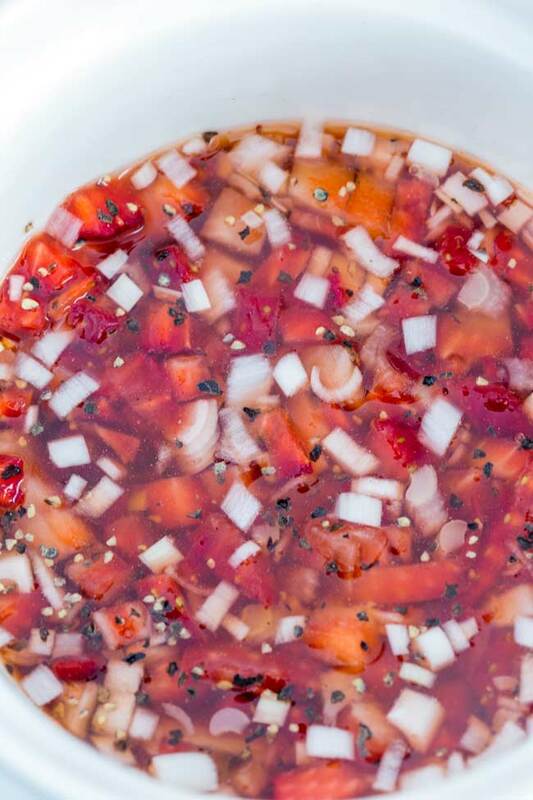 Traditionally red wine vinegar is used to make a Mignonette sauce. In this recipe I like to use champagne vinegar. But if you can’t find it, white wine vinegar is perfectly fine. In parts of Spain they use sherry vinegar, but that is really quite hard to find. If you do have some, it is wonderful with oysters! How to serve your oysters. I like to serve oysters on a bed of crushed ice. I know in many restaurants oysters will come on a bed of salt. But it feels like a waste of salt. Plus a bed of ice will keep the oysters chilled whilst your guest enjoy them. If you are worried about your table, fold a fabric napkin up and place it on a tray, then cover a shallow bowl or platter with crushed ice, arrange your oysters on the ice and set that on top of the napkin. The napkin and tray will save your table and it looks gorgeous. 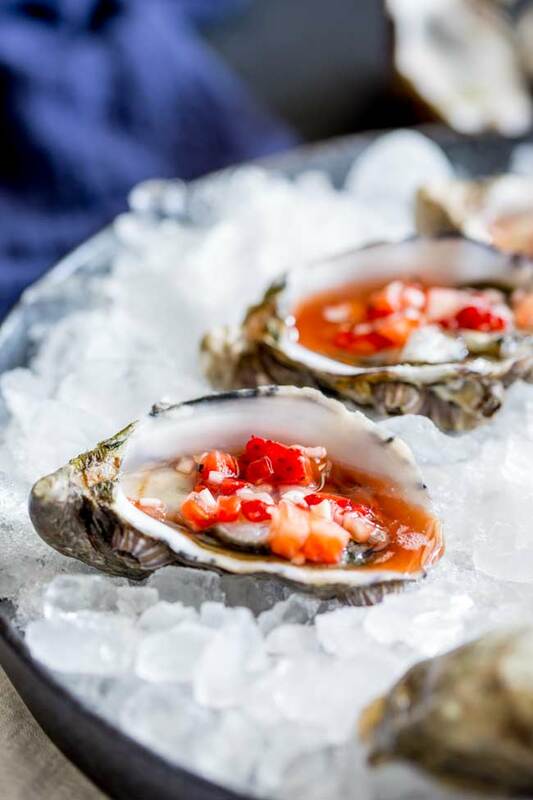 Why not pin this recipe for Oysters with Champagne Strawberry Mignonette. Pin it here. Peel and finely mince the shallot and place into a non-metallic bowl. Hull the strawberries and then finely chop them and add them to the shallots. Pour over the black pepper and vinegar. Stir to combine and let the mixture sit for 5 minutes. 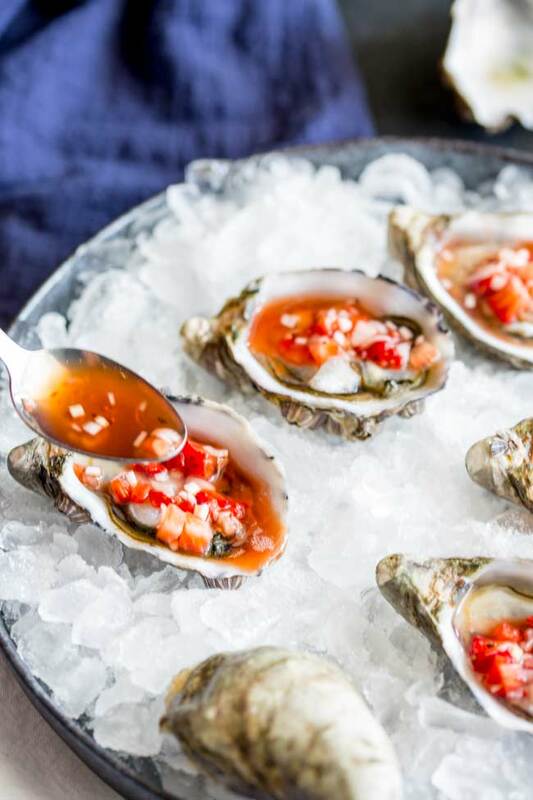 Spoon your mignonette dressing on top of the oysters and serve. I like to use champagne vinegar, but white wine vinegar or red wine vinegar will work just as well. Avoid balsamic vinegar. 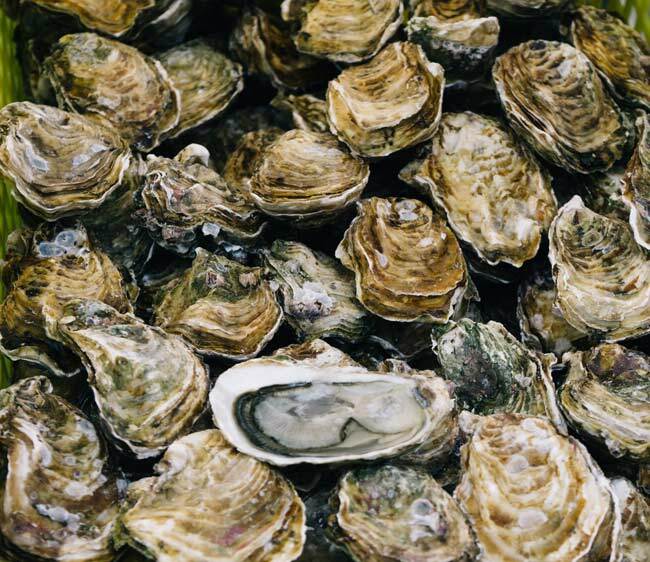 Place your un-shucked oysters in a bag. Remove the oyster from the freezer. Rinse with cold water to remove any dirt or debris. Leave the oysters on a draining board to defrost. The shells will pop ajar slightly as they defrost and you can easily remove them. Dress your oysters as per the recipe. 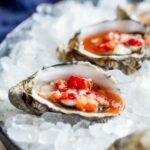 If you love food why not subscribe to my newsletter, I will drop you an email every now and then, just to say hi and send you a couple of recipes I think you might love, like these Oysters with Champagne Strawberry Mignonette.